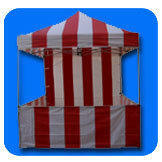 Our new carnival booth canopies are a great addition to any event. Pair them with our carnival games and create an event you will not forget. Our canopies are 8 feet by 8 feet, have a striped back wall and 3 striped skirts.